Wrong. 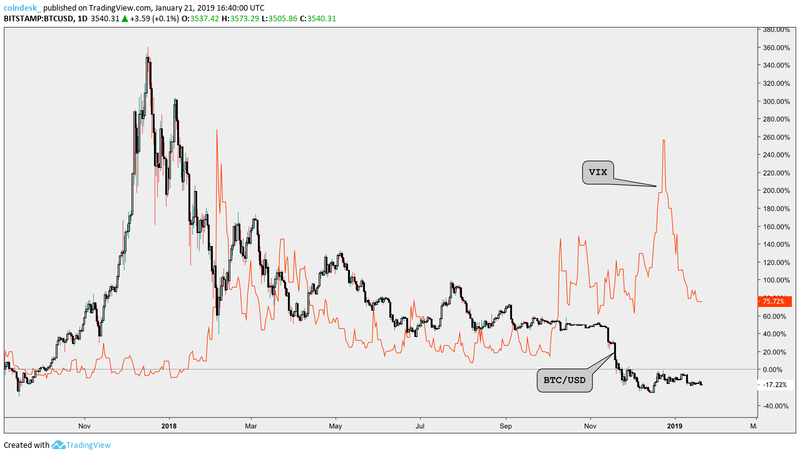 Bitcoin inversely correlated with the VIX on both occasions. When the VIX reached its first peak, bitcoin had just finished falling 70 percent from its January highs and during the second peak, its price had just declined another 50 percent. For reference, the globally recognized safe haven asset, gold, positively correlated with the VIX during its two major peaks in 2018. During the VIX’s February high, gold (US$/OZ) largely traded sideways between $1,300-$1,370 and only began to fall toward $1,160 in May as the VIX sank and the S&P 500 regained strength. Gold, again, correlated with the VIX during its December peak. As equities began crashing and fears of a global economic recession circulated, the shiny metal had already been in a 20 week long and more than 10 percent uptrend. Indeed, the physical physical store of value is still earning its name as a safe haven asset while the digital alternative has yet to be able to.